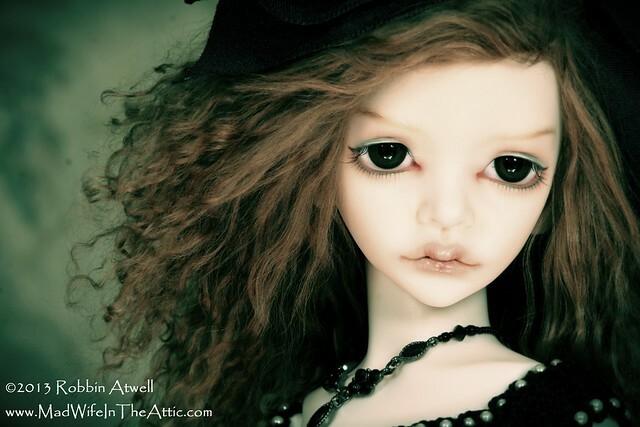 My friend, Monica, and I both fell in love with Doll-In-Mind Lalia’s funny little face. She has so much charm! 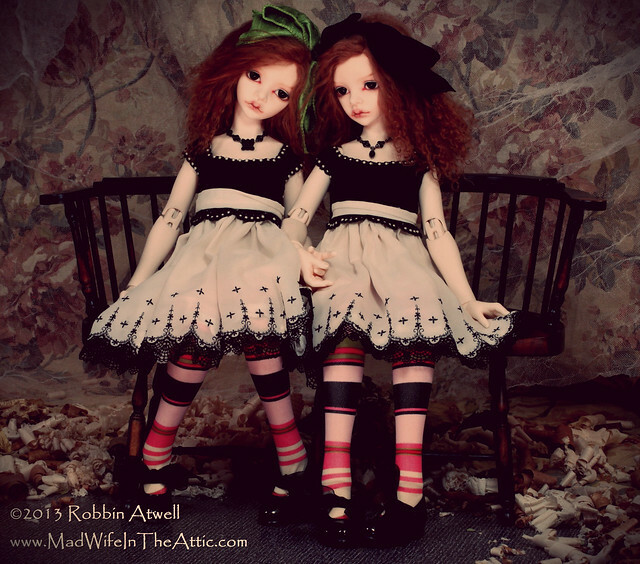 I thought it would be fun to have twins or “identical cousins” for photo shoots. 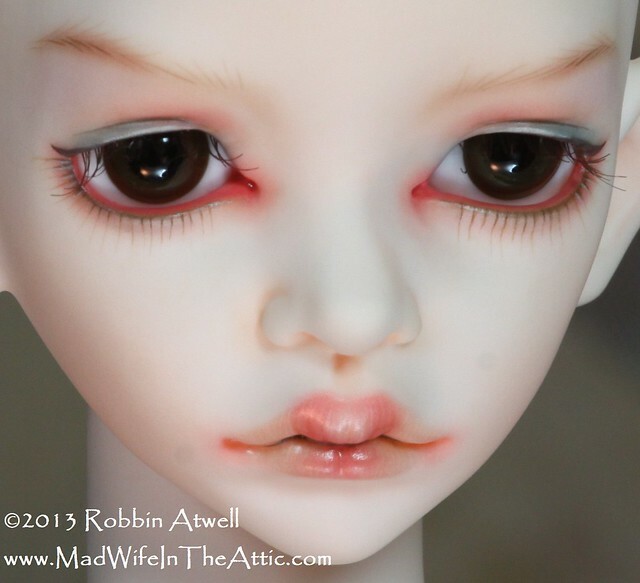 This is the first time I’ve painted dolls to look alike. It was a bit of a challenge but fun. This photo shows the blank face and both girls painted. 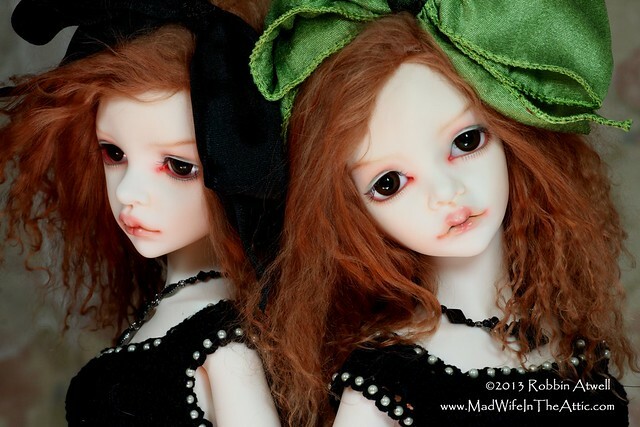 My doll is on the left, Monica’s doll is on the right. I have a lot of before-and-after face pictures on Flickr — click the photo below to see them. 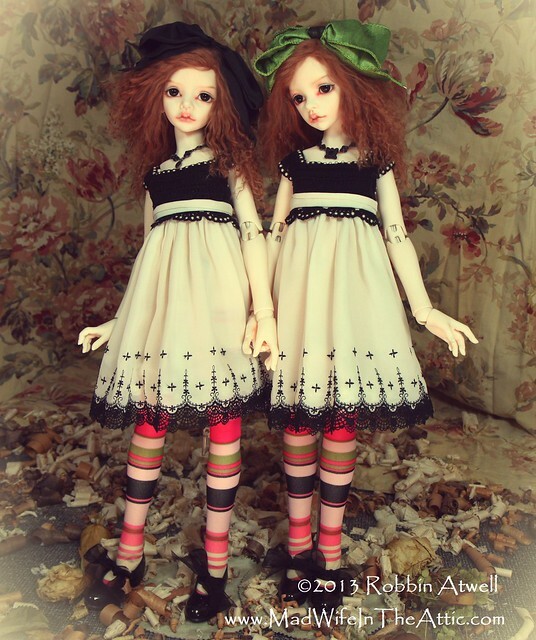 This is my favorite picture of the girls (My doll is wearing the black ribbon, Monica’s doll is wearing the green). Click photo to see many more photos in my Flickr archive. 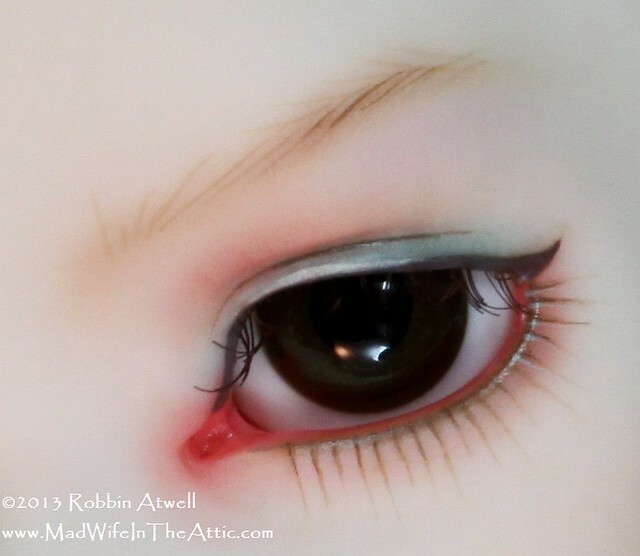 Click the photos below to see more eye and lip close up photos on Flickr. Notes: I made the dresses and auburn wigs. 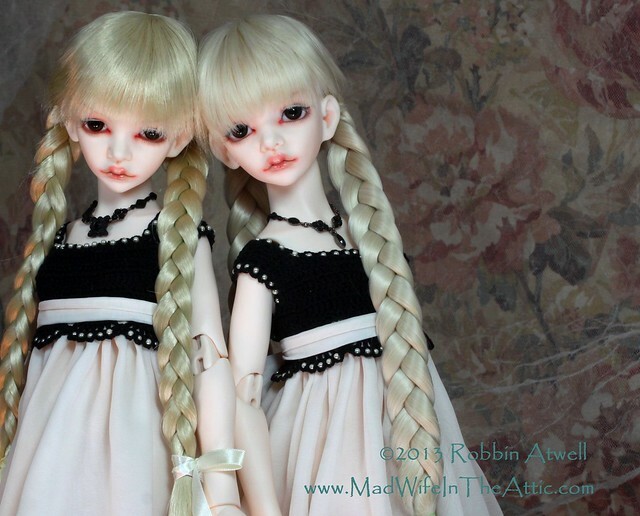 The blonde pigtail wigs are made by Volks and Leekeworld. Swan20 made the stockings. The shoes have been altered to add the bows. 21 Nov	This entry was published on November 21, 2013 at 12:52 pm. 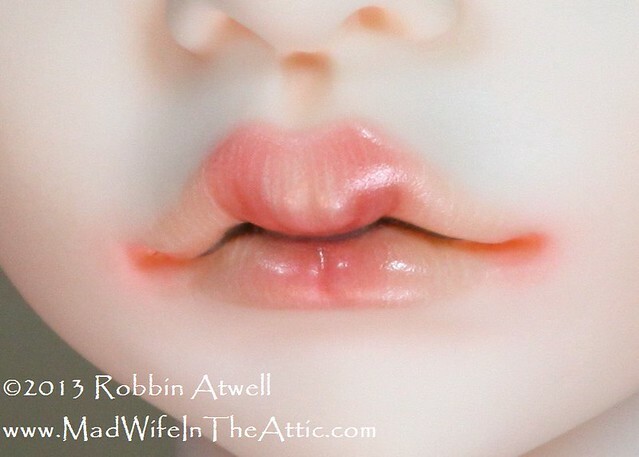 It’s filed under BJD Faceups, Doll Clothes, Modifications and tagged ABJD, Ball Jointed Doll, BJD, Doll, Doll In Mind, Dolls, Faceup, modification, Painting, Resin, Robbin Atwell. Bookmark the permalink. Follow any comments here with the RSS feed for this post. These girls are the BEST thing ever! I can’t stop looking at my girl, named Phoebe. I especially love her in the blonde braided wig. She reminds me of Rhoda, played by Patty McCormack, in the 1956 movie, The Bad Seed. Robbin is the MOST TALENTED person! Lalia is just the sweetest girl ever. 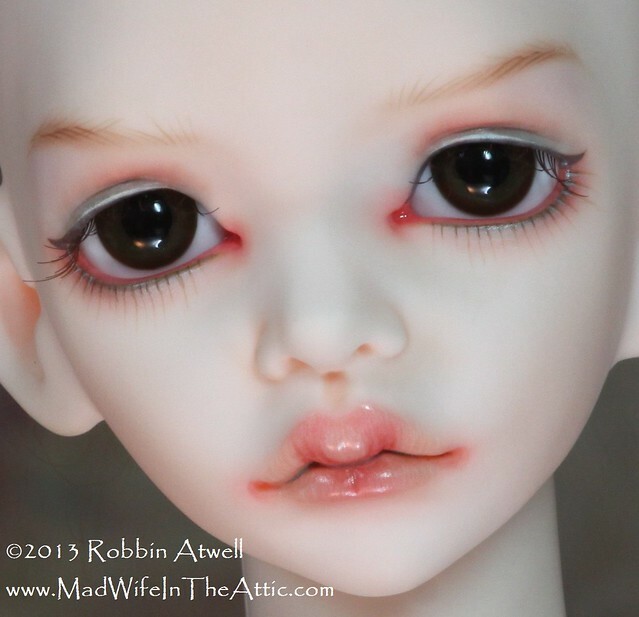 Thanks for sharing her beautiful photos Robbin, she is definitely a keeper.